A solar powered car is a vehicle that uses solar power in order to run. Solar powered cars usually have to combine technology which is used in aerospace, alternative energy and automotive industries. The design of a solar powered car is yet very strange and must be creative, since it is greatly limited by the amount of energy input into the car. Most solar powered cars that have been made didn’t go into mass production, since the core of the concept is yet in the process of development. Usually, solar cars depend on photovoltaic (PV) solar cells, which are contained in solar panels in order to convert sunlight into electricity, therefore making it possible for the car to run. Solar powered car will eventually run on the electricity produced from solar energy. The name "solar car" is usually used with vehicles, in which the solar energy is used to power all or even part of the vehicle's propulsion. At present solar cars are not yet sold as commercial products on day-to-day bases, they are primarily demonstration vehicles and engineering innovation success examples. However, indirectly some of the solar-powered or charged vehicles are already widespread and can be available commercially, such as solar powered boats or other. Since solar powered car will be highly limited by its size and area that can be exposed to sun, it is vital to place the photovoltaic cells on the vehicle itself. However this is not that easy in its realization, as sizes should be balanced with the total weight of the car itself and the power output possible. Theoretically energy can also be accumulated in batteries to lower car’s demand on the sunlight and provide operations in sunless situations, this has also to be closely looked at and explored, since batteries will add weight to the car and will increase its costs of production. The costs of manufacturing and assembly can be several times higher than that of a normal car. Even thought solar power is free, it is relatively expensive to create needed amount of solar cells in order to capture the sunlight. However, costs for solar panels are now declining; therefore it is possible that solar cars in the mere future will become more realizable and competitive. It should also be taken into consideration that standard solar cells are produced for stationary installations and therefore are not initially prepared to be used in car frame. Therefore solar panels need to be redesigned in order to be flexible (as polymer solar cell) and not less efficient, as well as be capable to withstand high vibrations during the ride. 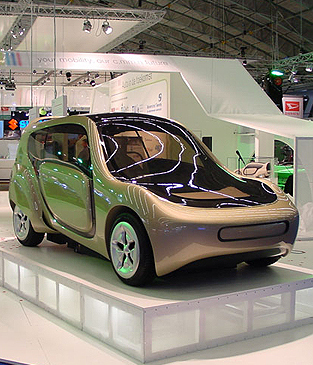 Solar powered cars usually have electric motor, which is run from the electricity that is produced by solar panels. Even the most efficient car that was designed could collect only a limited amount of power and energy over its surface area, covered with photovoltaic solar cells. Therefore till the present the possible solar cars were able to have only one passenger-driver, with no cargo possibilities. These cars still lay behind in such measurements as safety and convenience in comparison with conventional vehicles.